picha of Lisa E and her family on Cuddy's desk!. LOL, GUYS! I noticed this the sekunde time i was watching the episode! 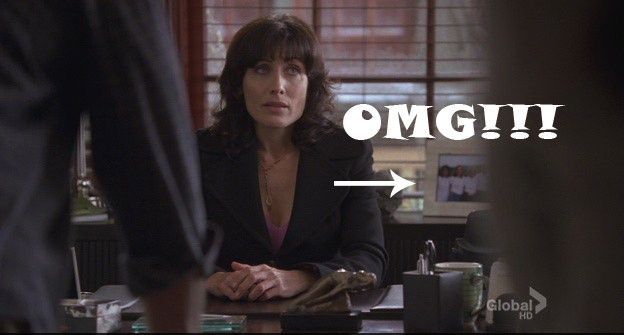 There's that exact same picture of Lisa on her family that i've seen before and now it's on Cuddy's desk! XD. Wallpaper and background images in the House, M.D. club tagged: house md cuddy lisa edelstein random observations the softer side screencap. This House, M.D. photo might contain brasserie, wamevaa vizuri mtu, suti, suruali nyayo, pantsuit, mtu wamevaa vizuri, suti ya suruali, ishara, bango, maandishi, ubao, matini, and ubao wa chokaa. OMG! That'd be cool if they could guest star someday ^_^. Or maybe they have already at the baby naming ceremony. I didnt notice that! Lol that is really cool! Wow that's cool! I'd never have noticed that! But when did you see this pic before? I've never seen it before! OMG!! So Cute!! My Lis Divineee! !